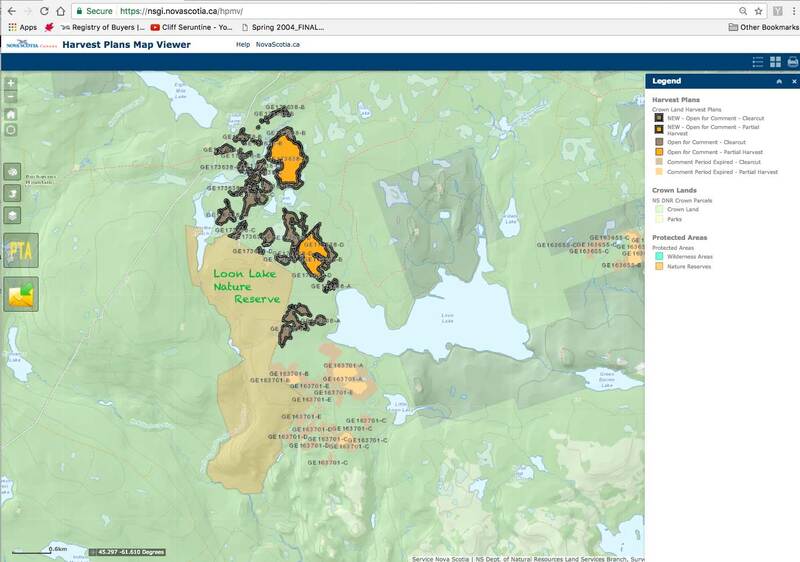 Forest Harvest Allocation Map accessed May 24, 2017 showing proposed cuts near Loon Lake Nature Reserve. Just earlier today I made a post about proposed clearcutting close to Gully lake Wilderness Area which was highlighted in an article in the Truro Daily News yesterday. Also today I received notice about the next set of proposed harvests and a friend asked if I had looked at it, telling me that a lot of cutting, mostly clearcuts, is proposed near the Loon Lake Nature Reserve in Guysborough Co. So I had a look at it, and indeed it’s “unbelievable but true” (see map). Loon Lake Nature Reserve, in eastern Guysborough County, harbours impressive stands of old-growth yellow birch and sugar maple forest. This forest is thought to have developed after a major wind storm about 200 years ago. There is little evidence of human use or disturbance throughout most of the site. Old forest remnants such as Loon Lake Nature Reserve offer a refuge to species that do poorly in the open and fragmented habitats that characterize much of the surrounding landscape. Nature Reserves are much smaller (currently 23-969 ha) than Wilderness Areas (most are 2000+ ha, largest is 120,000 ha) and are established to “protect rare, outstanding, or representative natural features or phenomena, such as old-growth forests or the habitats of rare or endangered plants or animals”. Because of their small size, they have a higher level of protection than Wilderness Areas, so even hunting and camping are not allowed. So if forestry is conducted close to the small Loon Lake Nature Reserve protecting old-growth yellow birch and sugar maple forest, it should be conducted in a fashion that protects those species. Seed production in sugar maple and yellow birch begins at about 40 years of age and reaches a peak at about 70 years. Selection management in a buffer zone would allow these species to survive in the buffer zone and increase the health and reduce the likelihood of loss of those species in the Nature Reserve; short rotation, even-aged forestry – whether involving clearcuts or partial cuts (other than selection cuts), would not. Thanks to CR for keeping an eye on the Forest Harvest Allocation posts and for letting me know about this one. I know that area well as I was the one who pushed to protect this area. It is the best stand of Yellow Birch I ever saw and I have harvested grade Hardwood for over 20 years from here to Wawa Ontario.The adjacent softwood being cut is junk balsam fir hardly worth cutting. Its real value is for winter moose habitat because the area protected has no softwood for winter protection. There is basically no softwood cover left anywhere near this site as it all was gobbled up by the mill at the strait. Ironically when I addressed this site for protection the staff at New Page said it was too crooked to protect and there are Veneer logs everywere… In this stand I will say with the leaves on you can look and see 10 thousand dollars worth of wood within eye sight meaning in less than a 100 metre circle. But it’s still classified as low grade hardwood by the [boys] at the strait. This entry was posted in Acadian Forest, clearcuts, Conservation, Loon Lake, NSDNR, Parks & Protected Areas. Bookmark the permalink.